The calm after the perfect storm. Yesterday we witnessed one of the most exciting rounds of the last years, with three decisive games and the World Champions losing or having to save their game. Today we're back to five draws, though some of the games were interesting. Kramnik vs. Nakamura can be considered a classic, and the game was good to follow. Vladimir got two bishops out of the opening, but it looked like he was a tempo behind. The game simplified soon, but the resulting position was open to tactical shots. And Kramnik found a nice tactic, that could have given him the upper hand. But Nakamura saw the menace and defended calmly. Karjakin and Caruana went for a Petroff. It was an interesting theoretical battle. Analysis of their game shows how important today is the preparation with chess engines. The two chess wizards followed the lines of the silicon players for a long while. Then, when the human factor stepped in, the game became unclear and full of possibilities, but none of the human players found a way to get an advantage. Nonetheless, they kept playing a tense rook ending, taking it down to the bare kings. Carlsen, after yesterday's shocking loss with Aronian, today played Giri. The World Champion tried to push, avoiding some drawish variations, but only to get slightly worse, though never in dire straits. Carlsen found a fine tactic in the endgame, but Giri dodged it, and the game ended in a draw. 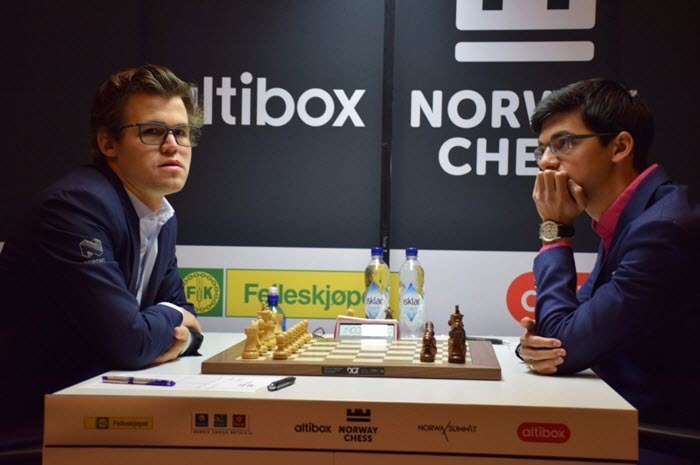 After the game, Carlsen looked quite disappointed and upset with himself. Here is GM Jon Speelman's video recap!